these are the 4 shampoo we are going to review, in this article. Interestingly, if your dog has dry skin, regularly bathing him or her using a quality shampoo will alleviate the condition. This will also help in the maintenance of a healthy skin and coat. The shampoo needs to be mild. This ensures that the natural oils in the skin are retained, preventing dry skin on dogs. Natural shampoos which contain colloidal oatmeal are ideal. Better still, you can use a conditioner to ensure moisture retention. 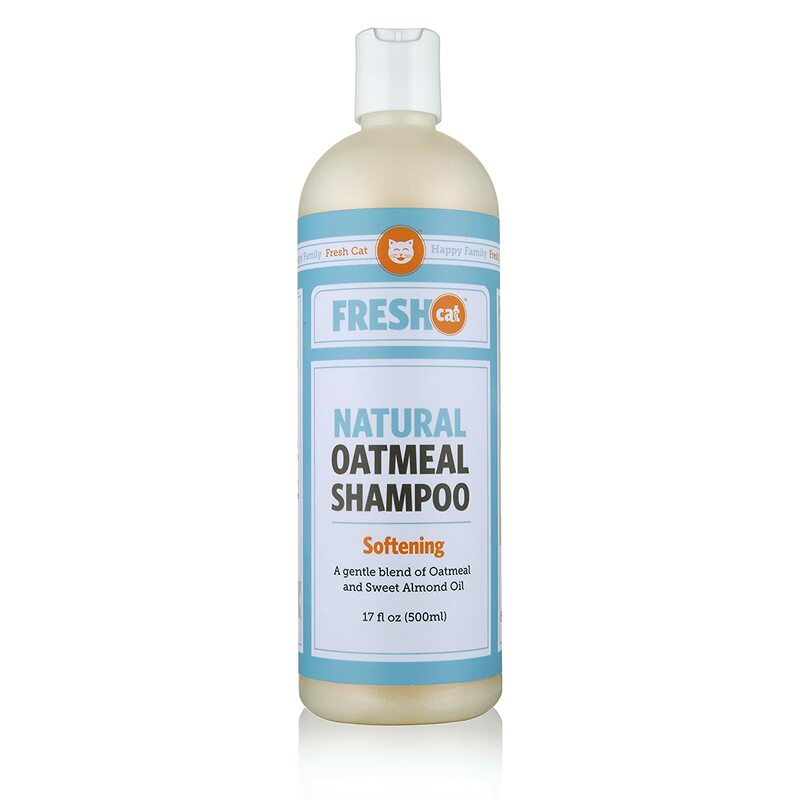 This shampoo is made from oatmeal. It restores natural moisture to your dog’s skin and coat. It provides a soothing scrub that alleviates itching. It reduces inflammation and does not strip the coat. It leaves the coat clean, soft and shiny. It does not worsen any allergies. It has a nice scent and lathers as well as rinses easily. It reduces flaking. This Shampoo is very concentrated, so a little goes a long way. It is suitable for use on any breeds. 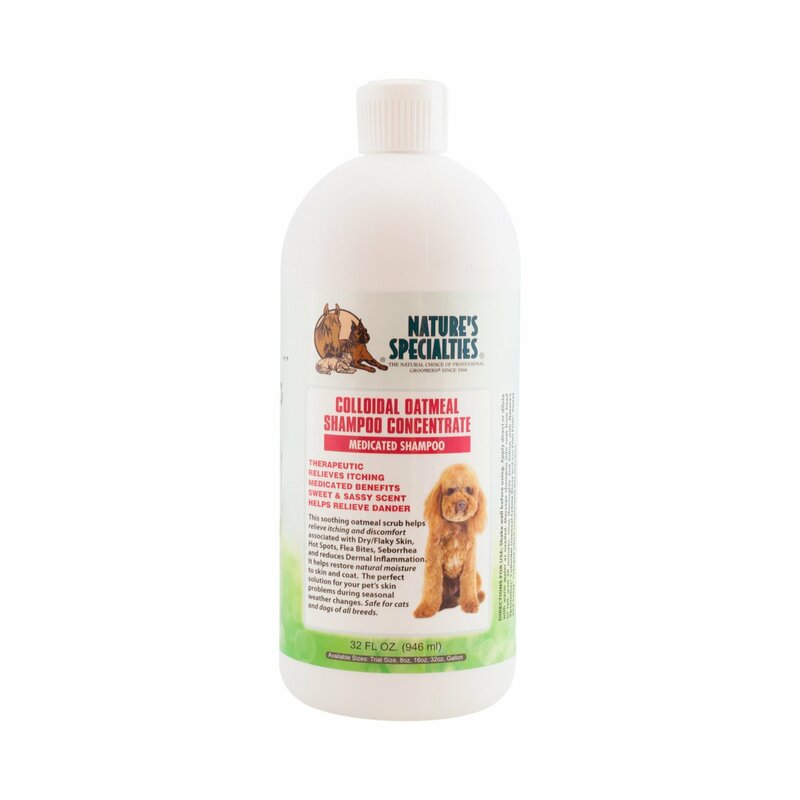 This is a conditioner that ensures optimal results for dry skin in dogs. It contains added emollients and essential oils. These restore body to the dog’s skin and coat. It makes the dog’s fur softer and shinier. It does not cause any skin irritation. You can dilute it, and you will still need to use only a little. It has a nice scent. This awesome moisturizes the skin and prevents itching. The Nature’s Specialties products tend to be a bit on the higher side when it comes to price, but their results prove worthwhile. This shampoo is made from natural colloidal oatmeal, and extracts of coconut, Echinacea, and sweet almond oil. It provides natural relief for itchy, dry and irritated skin. It leaves the skin clean, shiny and smooth. It has a nice scent. You can dilute it. You can see the results after a few washes. This shampoo does not interfere with other topical treatments, for instance, those of fleas. It does not irritate skin. A downside to it is that it does not lather easily. For best results, use it together with the conditioner. This shampoo is made up of all-natural ingredients: shea butter, sunflower oil, tea tree oil, and other ingredients that aid in alleviating dry skin in dogs. Tea Tree oil has antiseptic qualities. The smell keeps bugs and fleas at bay. Shea butter helps in healing skin and cracks. It also contains cinnamic acid that protects against the sun’s UV rays. Allantoin sooths irritation and promotes growth of tissue. Panthenol adds moisture. This shampoo has ingredients that go beyond just treating dry skin in your dog. It can be used to make 48 ounces of shampoo. You can begin to see results in a short time, for instance, 2 weeks. It softens and thickens fur. Just sprinkle some olive oil on your dog’s food 2 to 3 times per week. Regularly grooming your dog gets rid of dead skin and fur. If your dog has a double coat, the dead skin will mix with the undercoat resulting in flaking. Groom your dog at least 3 to 4 times a week. It also stimulates natural oils keeping the skin in good condition. You need to add the deficient nutrients, for instance, fatty acids ensure optimal coat health, especially omega-3 fatty acids. Add fish oil to your dog’s diet to alleviate dry skin on dogs. Processed foods are usually heated to extremely high temperatures which kills fatty acids. The best option is a raw food diet. If your dog spends a lot of time indoors, using a humidifier will ensure that his skin does not dry out. To conclude Dry skin in dogs can result from a number of problems. We would not want to see our favorite companions suffering. If your dog has dry skin, all you need to do is take up the challenge. You know how to from the above information.